Published in L. Frank Baum's first children's book, Mother Goose in Prose (1897), illustrated by Maxfield Parrish. You might enjoy the Mother Goose nursery rhyme, Wise Men of Gotham. Went to sea in a bowl. There lived in the great city of Gotham, over against the north gate, a man who possessed a very wise aspect, but very little else. He was tall and lean, and had a fine large head, bald and smooth upon the top, with a circle of white hair behind the ears. His beard was pure white, and reached to his waist; his eyes were small, dark, and so piercing that they seemed to read your every thought. His eyebrows were very heavy, and as white as his beard. He dressed in a long black mantle with a girdle corded about the middle, and he walked slowly and majestically, and talked no more than he was obliged to. "He is very wise, this great man; he is a second Socrates." And soon this was the only name he was called by, and everyone in Gotham knew him as "Socrates." To be sure this man was not really wise. Had they realized the truth, not one he met but knew more than Socrates; but his venerable appearance certainly betokened great wisdom, and no one appeared to remember that things are seldom what they seem. "My! how wise these people take me to be. Everyone admires my beautiful beard. When I look into their faces they drop their eyes. I am, in truth, a wonderful man, and if I say nothing they will believe I am full of wisdom. Ah, here comes the schoolmaster; I shall frown heavily and refuse to notice him, for then he also will be deceived and think I am pondering upon matters of great import." Really, the one wise thing about this Socrates was his ability to keep quiet. For, saying no word, it was impossible he should betray his ignorance. Singularly enough, over by the south gate of Gotham there dwelt another wise man, of much the same appearance as Socrates. His white beard was a trifle longer and he had lost his left eye, which was covered by a black patch; but in all other ways his person betokened as much wisdom as that of the other. He did not walk about, being lazy and preferring his ease; but he lived in a little cottage with one room, where the people came to consult him in regard to all their troubles. "Let us go and consult Sophocles, for he is very wise and will tell us what to do." Thus one man, who had sued his neighbor in the courts, became worried over the outcome of the matter and came to consult the wise man. "Tell me, O Sophocles!" he said, as he dropped a piece of money upon a plate, "shall I win my lawsuit or not?" "If it is not decided against you, you will certainly win your suit." And the man was content, and went away feeling that his money had been well invested. At another time the mother of a pair of baby twins came to him in great trouble. "O most wise Sophocles!" she said, "I am in despair! For my little twin girls are just alike, and I have lost the ribbon that I placed on one that I might be able to tell them apart. Therefore I cannot determine which is Amelia and which is Ophelia, and as the priest has christened them by their proper names it would be a sin to call them wrongly." "Cannot the priest tell?" asked the wise man. "No one can tell," answered the woman; "neither the priest nor their father nor myself, for they are just alike. And they are yet too young to remember their own names. Therefore your great wisdom is our only resource." "Bring them to me," commanded Sophocles. "This is Ophelia and this Amelia. Now tie a red ribbon about Ophelia's wrist and put a blue ribbon on Amelia, and so long as they wear them you will not be troubled to tell them apart." "Since no no [both nos in original] one can prove that I am wrong I am sure to be right;" and thus he maintained his reputation for wisdom. In a little side street near the center of Gotham lived an old woman named Deborah Smith. Her home was a wretched little hut, for she was poor, and supported herself and her husband by begging in the streets. Her husband was a lazy, short, fat old man, who lay upon a ragged blanket in the hut all day and refused to work. "One beggar in the family is enough," he used to grumble, when his wife upbraided him, "and I am really too tired to work. So let me alone, my Deborah, as I am about to take another nap." Nothing she could say would arouse him to action, and she finally allowed him to do as he pleased. "Here is another fool, for anyone could tell as much as this man does." "Tell me, O wise man, how shall I drive my husband to work?" "By starving him," answered Sophocles; "if you refuse to feed him he must find a way to feed himself." "That is true," she thought, as she went away; "but any fool could have told me that. This wise man is a fraud; even my husband is as wise as he." Then she stopped short and slapped her hand against her forehead. "Why," she cried, "I will make a Wise Man of Perry, my husband, and then he can earn money without working!" "Get up, Perry Smith, and wash yourself; for I am going to make a Wise Man of you." "You will," she declared, "for it is the easiest way to earn money I have ever discovered." Then she took a stick and beat him so fiercely that at last he got up, and agreed to do as she said. She washed his long beard until it was as white as snow, and she shaved his head to make him look bald and venerable. Then she brought him a flowing black robe with a girdle at the middle; and when he was dressed, he looked fully as wise as either Socrates or Sophocles. "You must have a new name," she said, "for no one will ever believe that Perry Smith is a Wise Man. So I shall hereafter call you Pericles, the Wisest Man of Gotham!" "This is Pericles, the wisest man in the world." "What does he know?" they asked. "Everything, and much else," she replied. "Pray tell me of your wisdom what is wrong with my mare?" "How should I know?" asked Pericles. "I thought you knew everything," returned the carter, in surprise. "I do," declared Pericles; "but you have not told me what her symptoms are." "She refuses to eat anything," said the carter. "Then she is not hungry," returned Pericles; "for neither man nor beast will refuse to eat when hungry." "Surely this is a wise man, for he has told the carter what is wrong with his mare." After a few days the fame of Pericles' sayings came to the ears of both Socrates and Sophocles, and they resolved to see him, for each feared he would prove more wise than they were, knowing themselves to be arrant humbugs. So one morning the three wise men met together outside the hut of Pericles, and they sat themselves down upon stools, facing each other, while a great crowd of people gathered around to hear the words of wisdom that dropped from their lips. But for a time all three were silent, and regarded one another anxiously, for each feared he might betray himself. "The earth is flat; for, were it round, as some fools say, all the people would slide off the surface." "Sophocles is wisest of all. What he says is truth." "The world is shallow, like a dish; were it flat the water would all run over the edges, and we should have no oceans." "Socrates is right the is wisest of all." "You are wrong, my friends. The world is hollow, like the shell of a cocoanut, and we are all inside the shell. The sky above us is the roof, and if you go out upon the ocean you will come to a place, no matter in which direction you go, where the sky and the water meet. I know this is true, for I have been to sea." "Long live Pericles, the wisest of the wise men!" "I shall hold I am right," protested Sophocles, "until Pericles and Socrates prove that I am wrong." "That is fair enough," said the people. "And I also shall hold myself to be right until they prove me wrong," declared Socrates, firmly. "I know I am right," said Pericles, "for you cannot prove me wrong." "We can take a boat and sail over the sea," remarked Socrates, "and when we come to the edge we will know the truth. Will you go?" "Yes," answered Sophocles; and Pericles, because he did not dare refuse, said "Yes" also. Then they went to the shore of the sea, and the people followed them. There was no boat to be found anywhere, for the fishers were all away upon the water; but there was a big wooden bowl lying upon the shore, which the fishermen used to carry their fish to market in. 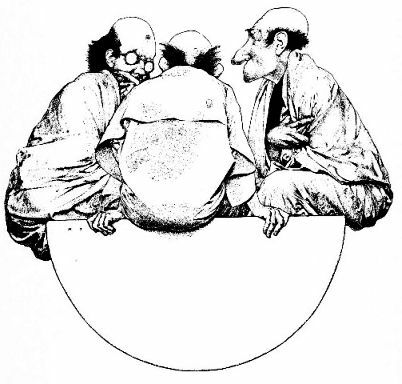 "This will do," said Pericles, who, because he weighed the most, was the greatest fool of the three. So the wise men all sat within the bowl, with their feet together, and the people pushed them out into the water. The tide caught the bowl and floated it out to sea, and before long the wise men were beyond sight of land. "I was a fool to come to sea in this bowl." "Ah," remarked Socrates, "if you are a fool, as you confess, then you cannot be a wise man." "No," answered Pericles, "but I 'll soon be a dead man." "I also was a fool," said Sophocles, who was weeping from his one eye and trembling all over, "for if I had stayed upon land I would not have been drowned." "Since you both acknowledge it," sighed Socrates, "I will confess that I also am a fool, and have always been one; but I looked so wise the people insisted I must know everything!" "Yes, yes," Sophocles groaned, "the people have murdered us!" He did not finish what he was saying, for just then the bowl broke in two. And the people are still waiting for the three wise men to come back to them. 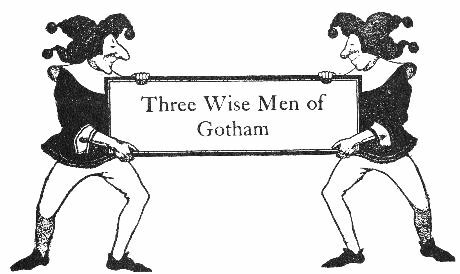 You might enjoy the Mother Goose nursery rhyme, Wise Men of Gotham. Add Three Wise Men Of Gotham to your own personal library.